When New York Times journalist James Reston went to China in 1971, he was in for a surprise. While in the country, he needed an emergency operation to remove his appendix. To his astonishment, the physicians performed appendectomy painful surgical procedure without anaesthesia as we know it. They used acupuncture as the only means of pain control. Following the media coverage including articles and video footage, some scientists were thrilled by the opportunities acupuncture could provide. Researchers were not interested to show how acupuncture works. They were inspired by the prospect of creating powerful drugs with no side-effects. No addiction, no damaged stomach linings. Just powerful analgesia and healing effect acupuncture provides. They did not succeed. Nonetheless, their studies revealed to the Western medical world acupuncture’s mechanisms and ability to treat pain. 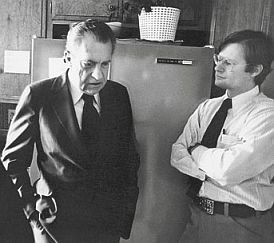 Journalist James Reston (pictured with Richard Nixon) recovered from appendectomy with no other analgesia but acupuncture. 93% or women and men reported successful treatment acupuncture in a study with 89,000 patients suffering with musculoskeletal pain. Acupuncture is great with pain. In fact, it is as effective as morphine. For this reason it’s commonly integrated in many pain clinics in Europe. Request an appointment to experience our difference! Or see what our patients say. “Acupuncture is comparable with morphine, but without the adverse effects of morphine, such as dependency”. Are you interested to learn more? Check out some more info about Headaches and Neck pain. Learn more about Dr Vitalis or see what our patients say. Acupuncture for pain syndromes is one of our fields of expertise.